It’s been a little more than three years since Safari Cup Coffee (somewhat) unexpectedly closed up shop at the corner of 21st St. (Richard Arrington, Jr. Blvd) and 3rd Ave. N. What some folks may not be aware of is that they simply moved the operation a few hours north to Chicago. The news first broke in Chicago on November 16 via Facebook, with DNAInfo and the Patch site for Lakeview both writing about McLaughlin’s concerns and the fact that Starbucks hasn’t exactly done anything wrong. 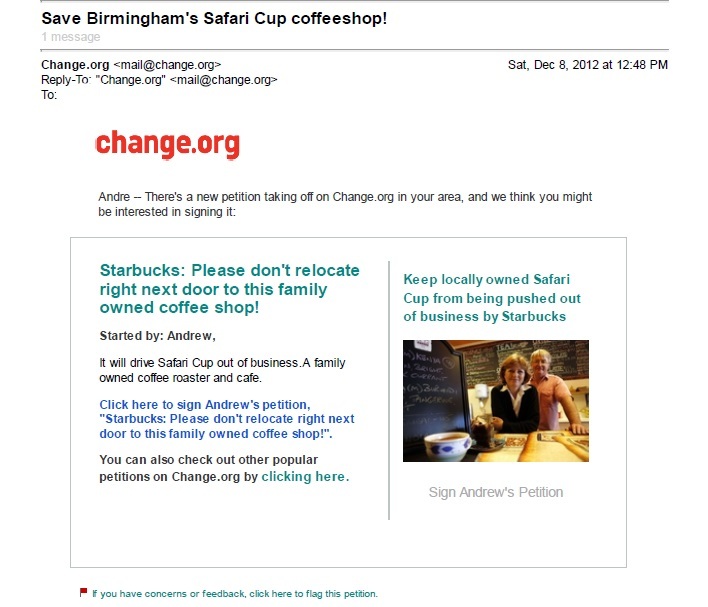 A local blog, 900poundgorilla, maintained by W.C. Truck, has also been vocal about the impending Starbucks expansion. He’s gone so far as to write an open letter to Starbucks CEO Howard Schultz on his site inviting him on his radio show Sunday (yesterday) on WCPT-AM 820. We don’t know if Schultz accepted the invitation. The Chicago Tribune shined the spotlight on the work of Cynthia Bathurst, a recipient of the American Veterinary Medical Association‘s 2009 Humane Award. in yesterday’s edition of the paper. The Birmingham, AL native currently serves as the head of Safe Humane Chicago, a “2-year-old effort to fight violence by promoting compassion for animals as well as people,” as reported by the Mobile Press-Register earlier today. The program works with more than 60 area organizations, including schools and churches and community groups to help get a message of anti-violence out to residents in the city’s high-crime areas. 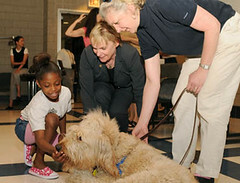 Bathurst has also been featured on the City of Chicago’s website and was a founder of D.A.W.G. Folks here in Birmingham don’t necessarily have to feel alone anymore when it comes to sales taxes. Earlier this month the City of Chicago raised the sales tax to 10.25%, making it the highest sales tax in the United States. That hasn’t been the only thing that’s gone up for Windy City inhabitants as pointed out in this report published in The University of Illinois at Chicago’s paper, The Chicago Flame.